British Airways has announced an extension of its chauffeur driven executive car connection service at Heathrow. 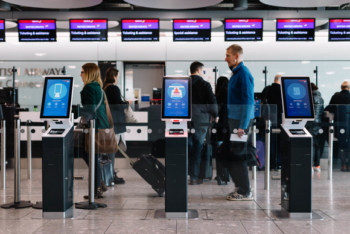 Passengers travelling in First, Club World or Club Europe, plus British Airways Gold and Silver Executive Club members who are at risk of missing their connection, will be driven to their next flight. Apparently an initial trial has proved successful and more vehicles are being added to the airline’s fleet. Other current initiatives to improve the Heathrow connection experience are in-air rebooking with your new flight details sent to the crew and a boarding pass waiting for you at the plane door, the allocation of planes with large numbers of connecting passengers to a gate in the same part of T5 and self-service boarding pass printers in the Flight Connections Centre. Emirates is offering an aggressive €1546 return fare in Business Class from Amsterdam to Bangkok. You need to book by 20th September and fly between mid December (90 days advance booking is required) and 31st March. A five-day stay is required. You can also have a free stopover in Dubai if you wish. There are two flights per day out of Amsterdam on an A380, and a less attractive Boeing 777 option. Of course, you can’t earn Avios on these tickets as they are on the Emirates flight code. (You DO earn Avios and BA tier points on Emirates flights if they are booked under the Qantas flight code.) Emirates is not in a major alliance so you will probably end up crediting to their own Skywards programme, albeit you can top these up with American Express Membership Rewards points. You can book via the Emirates website here. British Airways is actually cheaper than Emirates on some dates – I saw €1451 return available for Amsterdam to Bangkok via London – so this deal is really for someone who wants to give Emirates A380 Business Class a try and is less bothered about the miles or status points. Yesterday I wrote about the attractive Virgin Flying Club redemption on Air New Zealand from Tokyo to Auckland. That article is here. At just 40,000 Virgin Atlantic miles one-way in Business Class – and virtually no taxes – this is a great way to get to New Zealand. You can, after all, get to Tokyo relatively easily on Avios or, via their partner ANA, Virgin Atlantic. Reader David dropped me a note to say that there is an identical option available from Hong Kong. This is still on Air New Zealand and with the same pricing. Hong Kong is even easier to reach from the UK with either Avios or Virgin Flying Club miles. You can use the United Airlines website to check Air New Zealand availability between Hong Kong and Auckland. It seems OK for November, February and March but – like Tokyo – they have yet to open up anything later. Singapore and Shanghai are other possible starting points in Asia served by Air New Zealand although you are at the mercy of their erratic reward seat availability. O:T, just boarded BA 107 LHR-DXB. Was told there no priority boarding anymore. Another great idea. O/T I am trying to self refer from a Gold Amex to a Black BA card but when I click on the refer link I only get the option of a Gold or Plat Amex even when clicking “view other cards.” What am I doing wrong? Thanks. It defo working again from both my Platinum and my wife’s Gold. Visit the link in a new browser, click the ‘View our other Cards” button and you should see three tabs ‘Charge Cards’ ‘Credit Cards’ and ‘Business Cards’. Click learn more on the required one and fill out the application form. OT – just called amex to cancel my BA PP card. They said I’d lose my unattached / unused 2-4-1 voucher which still has over a year to expiry. Thought I had read here previously that cancelling the card wouldn’t void the voucher, can anyone confirm? Many people have confirmed this over the past few years. I just read 1 plausible case history where somebody lost the 2-4-1 voucher in that time, could easily also have been user error. I haven’t even seen one example for a credible source. The only one I’ve seen is from someone working for BA. Ha, I’ve never heard anything credible coming out of BA either ???? Haha perhaps one of the oldest ones in the books 😉 Advice on here is correct, Amex agents are wrong. The first two bottle I had from the case were fairly disappointing to be honest. They’ve offered to collect the rest and refund me, just deciding if it’s worth the hassle. What do you expect for £3.21? Might do a reminder over the weekend. Any info ad to the definitive date of Avios.co closing? Need to do a transfer and combine,hoping the avios will not go in a black hole!! Still today as far as I know. If I only have a household BA acct, I can’t transfer from avios ? OT: Gregg’s doesn’t accept AMEX . On plus side drinking my free cappuccino via Three’s wuntu app. Plus there’s the occasional freebie with the App. Passports, good to know: the Passport Office is no longer adding unexpired months onto your new passport, effective 10th September. Many countries require 6 months left on your passport, so this rule change will work against you. For others, you may want to delay renewing your passport until the last month or so, depending on travel plans. No word yet on whether the EU will need you to have 6 months remaining or not when you enter. Anyone know which countries have a 6 month rule? It tells you on the individual country pages on the foreign office website for travel abroad. Might take a while to go through all of them but I’m sure I’ve seen many countries that don’t need any additional validity. Wow that’s pretty rubbish – always made use of that in the past. O/T Tesco’s new discount store format, Jack’s – meant to take on Aldi & Lidl – will NOT give Clubcard points. Does anyone here use Experian web monitoring? I’ve had several emails from them last week telling me that my email phone number last name and postcode have been published and sold illegally online. Wonderful. Thanks BA. OT: gold card anniversary bonus. Wondering if you can bag the 10000 point bonus then ring up and cancel and get a pro rata refund? My wife has her year coming up and this seems like an easy win or have I misunderstood? OT: Ryanair: Book a 3 night stay and only pay 2 nights! Your discounted night is already deducted in the package price. Just got this through, might see if it’s worthwhile, but rarely do city breaks longer than the weekend in Europe!